Urban, suburban and rural communities in the U.S. face a host of problems today. Some are common across community types, while others are tied to the unique nature of life in these different areas. In some cases, such as drug addiction and jobs, views about the severity of local problems are more strongly linked to race and socio-economic status than they are to the type of community one lives in, suggesting that some of the challenges Americans face today may be rooted more in demographics than in geography. In urban and rural communities alike, about half see drug addiction as a top-tier problem: 50% and 46%, respectively, say this is a major problem in their local community. A smaller but substantial share of adults living in suburban areas (35%) say drug addiction is a major problem where they live. There is more concern about affordable housing, poverty, crime and the quality of public schools among urban residents than there is among their suburban and rural counterparts. For example, 52% of adults living in urban areas say the availability of affordable housing is a major problem in their local community, compared with 34% in the suburbs and 36% in rural areas. Similarly, urban residents are about twice as likely as those living in the suburbs to say crime is a major problem where they live (35% vs. 16%). One-in-five rural residents say crime is a major problem in their community. Some problems stand out as being particularly acute in rural areas. Rural residents are significantly more likely than those living in urban or suburban areas to say the availability of jobs: 42% of rural residents say this is a major problem in their community, compared with 34% of urban and 22% of suburban residents. Rural residents are also significantly more likely to say access to public transportation is a major problem where they live. While relatively few adults across community types say access to good doctors and hospitals, high-speed internet and grocery stores are major problems where they live, significant shares say each is at least a minor problem. Rural residents stand out in each case. When it comes to access to health care, two-thirds of rural residents say this is either a major or minor problem where they live. By comparison, roughly the same share of suburbanites (64%) say this is not a problem where they live. Similarly, while 58% of adults in rural areas say access to high-speed internet is a problem for them – including 24% who say it is a major problem – smaller shares of urban (43%) and suburban (36%) residents say this is a problem where they live. Suburban residents are significantly less likely than their urban or rural counterparts to characterize access to grocery stores as a problem in their community. Only 20% do, compared with 33% of those in urban areas and 43% in rural areas. Concern over racism is roughly comparable in urban and rural communities – 21% of urban residents and 17% of rural residents say this is a major problem. A slightly smaller share (13%) say this is a major problem in the suburbs. The condition of roads, bridges and other infrastructure is a major problem for 36% of urban, 27% of suburban and 32% of rural residents. Traffic, on the other hand, is a much bigger problem for those living in cities (36% say this is a major problem) or suburbs (29%) than it is for adults living in a rural area (13%). Across community types, majorities of Americans say drug addiction is a problem in their community. Overall, 42% say this is a major problem and an additional 45% say it is a minor problem. Concerns about this issue don’t vary widely between whites and nonwhites, nor do they differ markedly by age. Views on the severity of this problem do differ significantly along socio-economic lines. While a third of adults with a bachelor’s degree or more education say drug addiction is a major problem in their local community, roughly four-in-ten of those with some college education (43%) and an even higher share of those with a high school diploma or less education (48%) say the same. Similarly, those who describe themselves as upper class express less concern about drug addiction than do those who describe themselves as middle or lower class. In fact, fully 50% of lower-class adults say drug addiction is a major problem where they live. These gaps hold up – for the most part – across community types, although the class differences are not evident among rural residents. Overall, 31% of Americans say the availability of jobs is a major problem in their local community and 45% say this is a minor problem. Roughly one-in-four (23%) say this is not a problem in their community. Perceptions about local job conditions differ not only by community type but also by key demographic characteristics. There is a significant racial divide in views about the availability of jobs, with nonwhites much more likely than whites to say this is a major problem where they live (40% vs. 26%). This gap can be seen across community types, with significantly larger shares of nonwhites voicing concern about the availability of jobs where they live. In rural areas, where a higher share overall says jobs are a problem, 53% of nonwhites and 38% of whites characterize this as a major problem. Views on the availability of jobs differ by educational attainment and income as well. Overall, 22% of adults with a bachelor’s degree or more education say this is a major problem in their local community, compared with 35% of those with some college or less education. Similarly, adults with annual household incomes of less than $30,000 are about twice as likely as those with incomes of $75,000 or higher to say the availability of jobs is a major problem in their community (43% vs. 20%). These patterns are consistent among urban, suburban and rural residents. A mericans have mixed views about how the job situation will be in the future. About a third (34%) say they expect the availability of jobs where they live to be better 10 years from now, 20% say it will be worse and 45% say it will stay about the same. Adults from urban areas are more optimistic than those living in suburban and rural areas. Rural residents are the least optimistic. Four-in-ten urban residents say they expect the job situation in their local community to improve over the next decade, compared with 34% of suburbanites and 28% of those living in rural areas. Roughly one-in-five across community types say they expect the job situation to get worse where they live. 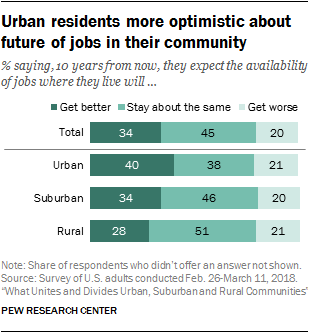 Among suburban and rural residents who say the availability of jobs is a major problem in their community, relatively few are optimistic that things will improve over the next decade – 20% of those living in rural areas and 21% of suburbanites. Nonwhites consistently voice greater concern than whites about the magnitude of a variety of problems in their community. In many cases, the racial gap persists across community types. In urban, suburban and rural areas, nonwhites are significantly more likely than whites to say that poverty, crime, racism, jobs, access to good doctors and hospitals, and access to high-speed internet are major problems in their local communities. In some cases, whites in the suburbs stand out as being the least concerned about these issues. For example, when it comes to poverty, 17% of suburban whites say this is a major problem in their community, compared with 28% of rural and 35% of urban whites. There’s a racial divide in suburban and rural communities when it comes to housing, the quality of K-12 public schools, access to grocery stores, and traffic. Whites and nonwhites in urban areas express similar levels of concern about these issues. There are also socio-economic divides on several of these problems. When it comes to poverty, crime and infrastructure, as well as access to quality medical care, high-speed internet, and grocery stores, adults with less than a four-year college degree are significantly more likely than college graduates to express high levels of concern. For example, 32% of adults without a bachelor’s degree say poverty is a major problem where they live, compared with 24% of those who have a four-year college degree or more. Similarly, while about one-in-five adults without a four-year college degree (17%) say access to high-speed internet is a major problem in their community, only 8% of college graduates say the same. The educational divides in views about these local problems are less consistent than the racial divides across community types. On views about crime and access to doctors, less educated adults express higher levels of concern than those with a bachelor’s or higher degree in urban, suburban and rural areas.